Premium, rich-lathering liquid soap with mild, yet effective skin cleaners. Conditioners and moisturizing agents smooth and protect skin by maintaining its natural pH balance. 1 gallon size for refilling soap dispensers. 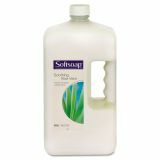 Softsoap Moisturizing Hand Soap w/Aloe, Liquid, 1gal Refill Bottle - Softsoap Refill Moisturizing Liquid Soap has a gentle feel on the skin but works hard to eliminate soil. The premium soap has a pure Aloe Vera extract and moisturizer to keep skin soft and smooth without stripping away natural oils., a soothing experience that is a treat for the hands. The rich, creamy formula softens hands with light moisturizers. he soap rinses away quickly to leave a clean, refreshed feeling. 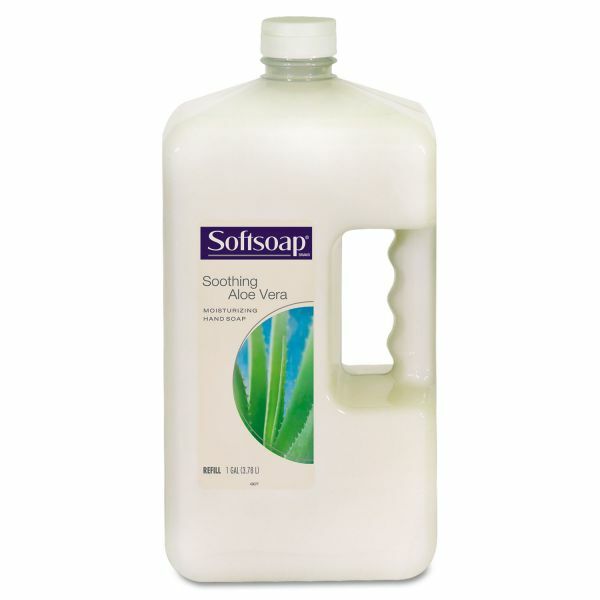 Softsoap Liquid Soap has a concentrated formula offering a rich lather with only a few drops. Preservative system works to protect against microbial contamination.